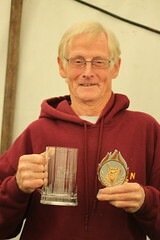 Mick joined Northampton Road Runners (formerly The Trades) in the 1990's having previously run with Northampton Phoenix and his Thursday night club. He was renowned for his Random Distance running, regularly taking part in events such as Ridgeway 40, Two Bridges 35 miles Challenge, 100 km London 2 Brighton and 100 mile runs. Many members were introduced into off-road running through Mick and took part in many events like Charnwood Hills, Belvoir Challenge and Colworth Marathon Challenge. In recent years Mick had become an elder statesman and friend to all and was a great inspiration to new members and old alike. If Mick was running near you in a race you were certain to hear the cheery 'Thank you marshal' in appreciation of the volunteers. You made me feel so welcome on my first visit to the club and looked after us beginners on Wednesday night group runs like some wise old mother hen, we hung on to your every word and when we faltered you picked us up, and you certainly made us laugh! I would like to say how much Mick welcomed me into the club and I remember him offering to give me a lift to my first 10K in Flitwick and both myself and Jo Cummings ventured down with him. He had been out the night before and was a little hungover but that didn‘t stop him. Of course he sped off and finished triumphantly but he waited for me at the end with lovely Jo and he gave me the biggest hug and cheer (I was very slow) but do you know, it made me realise I can do this and Mick, in your memory, I will do my first marathon in May this year and I will have you in my sights every step of the way.